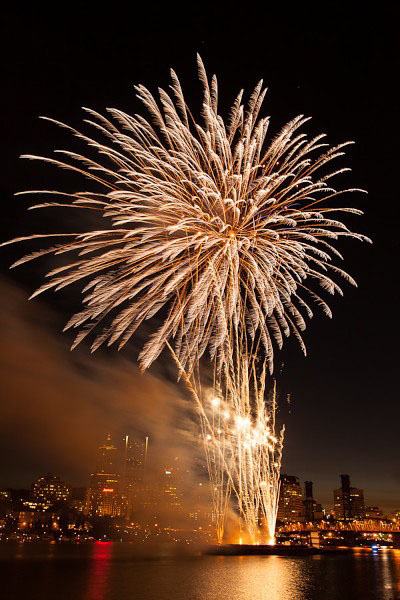 Each month the team over at SizzlPix choose a SizzlPix Pick of the Month from our Photo Assignment participants. 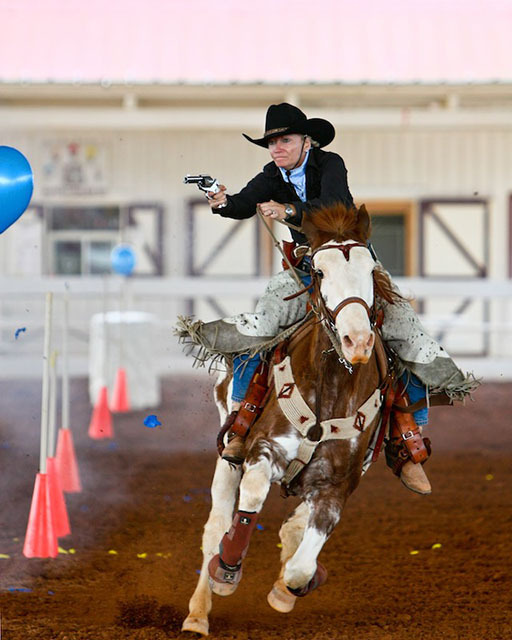 I thought it would be fun to share the winning images from the last few galleries. Thanks everyone for participating! And congrats to all of our winners. 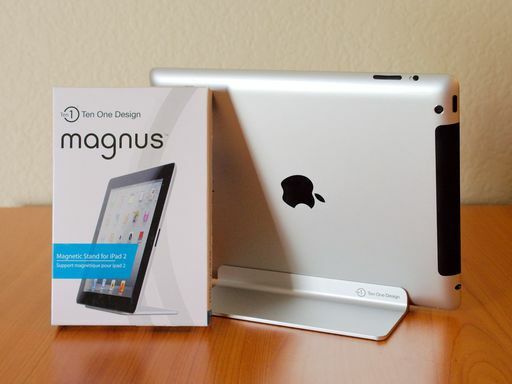 I discovered the Magnus iPad stand when riffling through my gift bag after speaking at the Mac Expo 2012 on Saturday. Created by Ten 1 Design, the Magnus is machine-crafted from pure aluminum. It's elegant and infused with the Apple aesthetic. It supports an iPad 2 or 3rd Gen iPad in landscape position. It does so securely by "clicking-in" via magnets. From the front, it looks as though your iPad is suspended in air. But when you work on your device, it's very stable. You can also position the iPad in portrait mode, but without the stability of the magnets to hold it in place. Neither I, nor Ten 1 Design, recommend using the stand this way. You can purchase the Magnus directly from Ten 1 Design for $49.95 US. It's contemporary sculpture for your iPad. The latest firmware update (V 1.5) for the Olympus OM-D E-M5 quiets its humming sound when you're not actually taking a picture. After the update, the camera is very quite while powered up. When you press the shutter button to take a picture, the image stabilization system kicks in, and you'll hear the familiar hum as long as the shutter button is pressed halfway or full. It's a good solution. 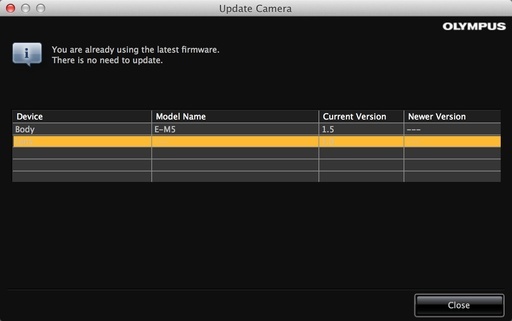 The Olympus Camera Updater is an easy way to upload new firmware. Logic would say that this change would also have a slight improvement on battery life, even though that isn't stated in the documentation. Another benefit of firmware V 1.5 is improved 5-axis stabilization when using OM lenses with an adapter, even in movie mode. 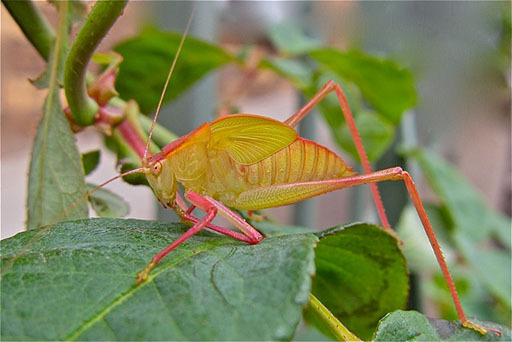 This enhances a big advantage of the OM-D, which is image stabilization for any lens you put on the camera. The firmware is easy to apply. 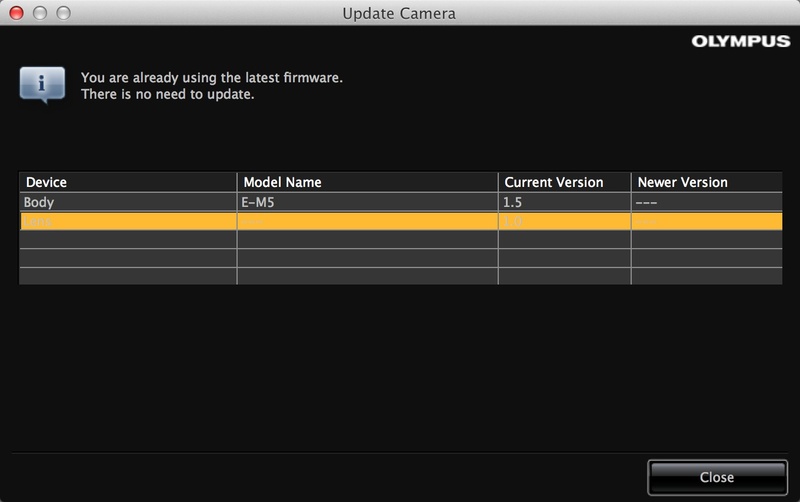 Just use the camera updater app. In my initial testing, everything is working great. 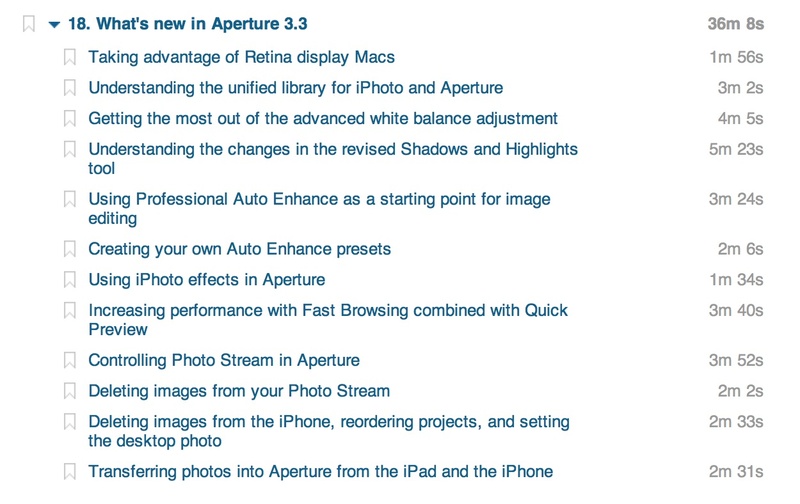 lynda.com has just released Aperture 3.3 Essential Training (2012), the updated, comprehensive video training for Apple's professional photo management application. This title includes more than 8 hours of tutorials, divided into short movies that focus on specific techniques. As you watch a movie, you can practice on your own computer, as many times as you want, until you've mastered each move. We've updated many of the previous tutorials from the original Aperture 3 Essential Training to reflect the changes in the application. 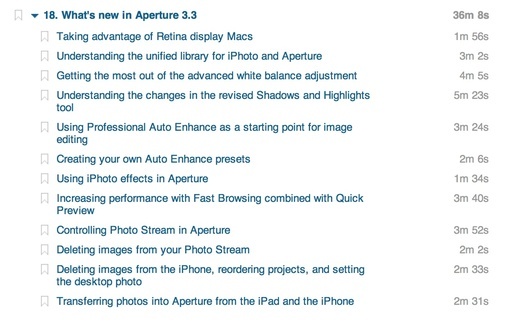 Additionally, we've added an entirely new chapter titled, "What's New in Aperture 3.3," that features instruction on the functionality that's been incorporated since the app's initial release. 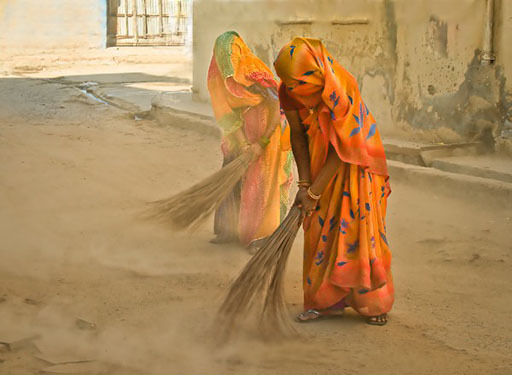 Two of those movies, "Taking advantage of Retina display Macs," and "Understanding the unified library for iPhoto and Aperture," are available for free viewing. 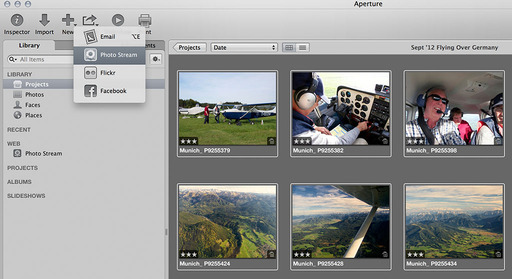 We will continue to publish new training for Aperture and iPhoto. In fact, we're already planning to record additional movies later this Fall. 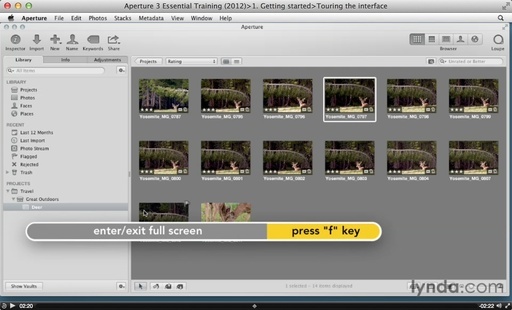 In the meantime, take a look at Aperture 3.3 Essential Training (2012). It will help you keep pace with the evolution of this excellent photo management and editing application. 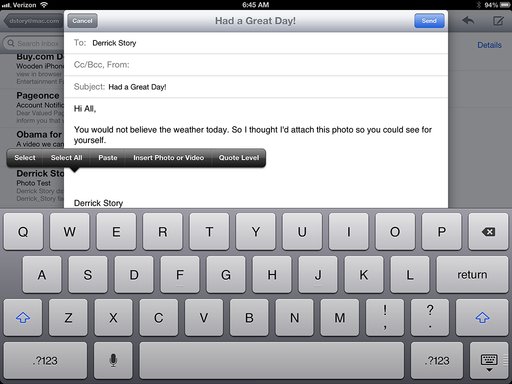 Attaching photos to email just got a lot easier in iOS 6. Now you have the option to add images while you're in the Mail client. You no longer have to start with the picture in the Camera Roll. So, if you're typing a note and decide to add a picture to it, no problem. The process is essentially the same on both the iPad and iPhone. Here's how it works. 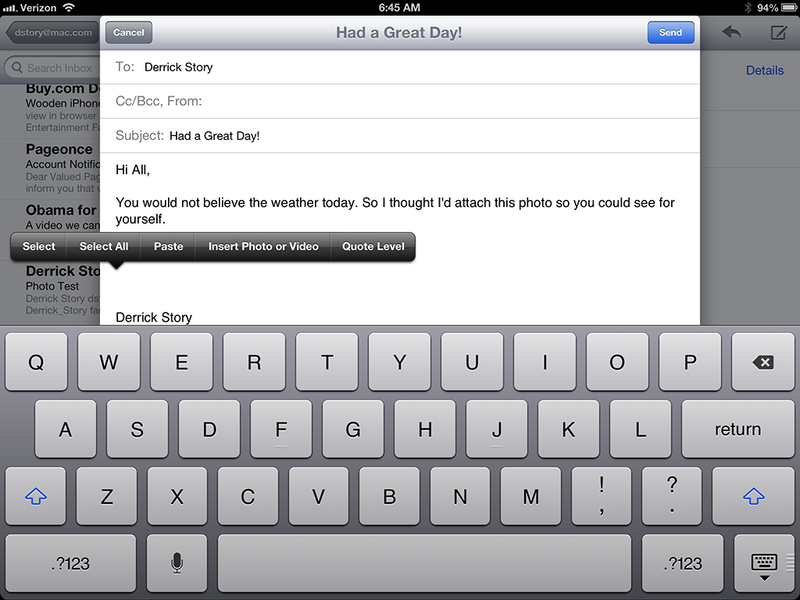 On your iPad or iPhone, tap and hold anywhere in the body of the message. You'll get the familiar "Select/Select All" popup. On the iPhone, there will also be an arrow pointing to the right. Tap it to reveal, "Insert Photo or Video." On the iPad, there's enough real estate to display this from the start. Tap "Insert Photo or Video" and a new popup appears with all of the available photos on the device. Choose the one you want, then tap the Use button. The image will be attached. 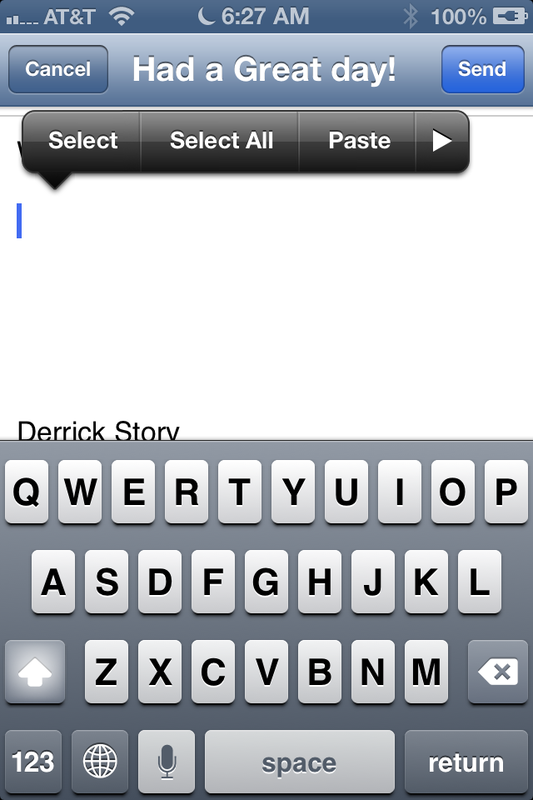 On the iPhone, you'll see another screen after you tap the Send button asking you what size the image(s) should be. On the iPad, the attachment size is listed in the right corner of the CC field. If you tap on it, you can reveal the Image Size options for your photo. 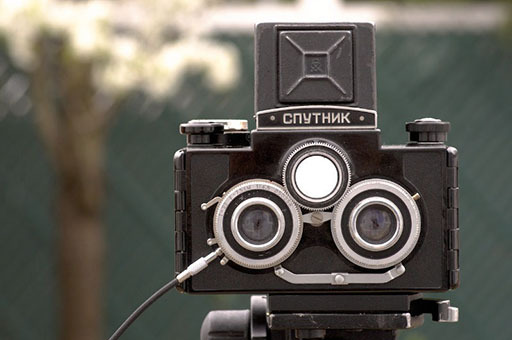 This is a terrific improvement for photographers. 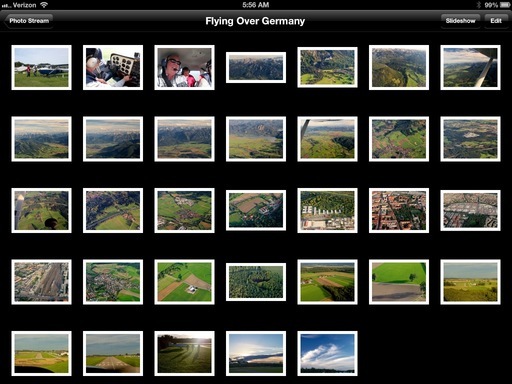 With the new Shared Photo Stream in Aperture 3.4.1 and iOS 6, you can set up mobile portfolios that can be viewed on your iPad, iPhone, Mac, or even Windows computer. You can limit accessibility to just your devices, or share individual streams (mobile portfolios) with friends. Here's how to set it up. To get started, select your photos and then click on the Share button in Aperture. First, you have to designate one library as your Photo Stream environment. This library can be opened in either iPhoto 9.4 or Aperture 3.4.1. You can't maintain Photo Streams from multiple libraries with one iCloud sign-in. So I've established one library that is my "Photo Stream Mission Control" and maintain it with iPhoto or Aperture, depending on my needs at the moment. Remember, it's very easy to switch among libraries now with the Shared Library Container. 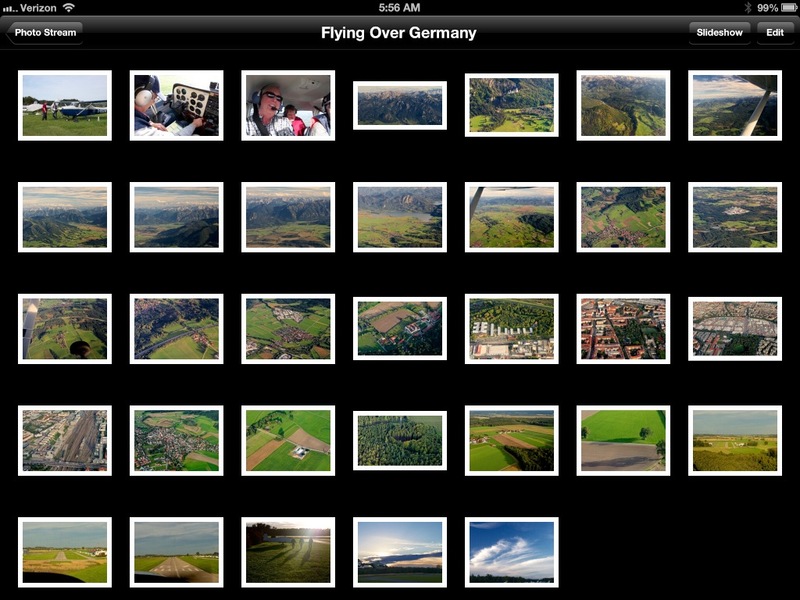 Select a group of photos, then click on the Share button and choose Photo Stream. 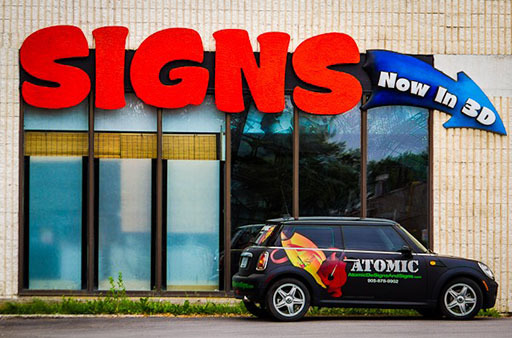 If this is your first, you'll be asked to give it a name. 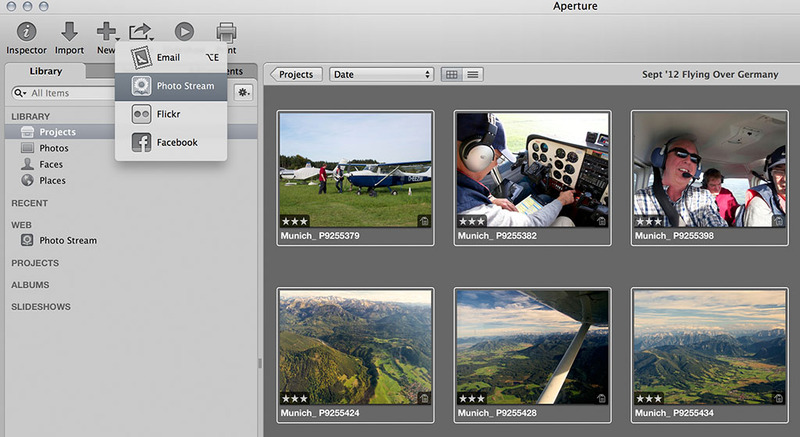 After that, you can add the selected images to an existing Photo Stream, or create a new one. I like creating unique Photo Streams for portfolio sharing. That way I can show a curated collection of photos instead of sifting through everything I've got. This helps with viewer attention span too. If you leave the "Share With" box blank, the Photo Stream will only be viewable on your devices. Now you can set some parameters. If you want to share this with someone else, enter their iCloud email into the dialog box. They will be able to view your images on any iCloud-enabled device. If the person doesn't have an iCloud account, you can still share with them, but then you have to check the box next to Public Website. The recipient will receive an email notification with a link they can view in any web browser. However this method puts your images on the Web, which is something you may not want. For tight control, it's best to stay within the iCloud ecosystem. 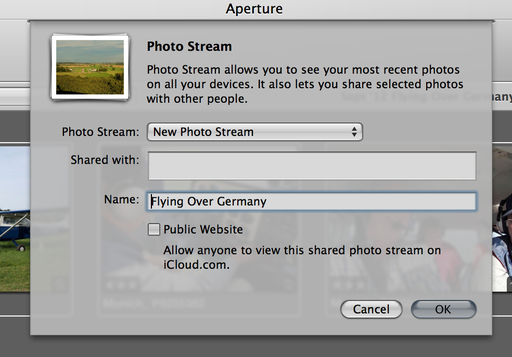 For Photo Streams only to be viewed on your ecosystem of devices, leave the "Shared With" box blank. Now I can show off my pictures on the iPad or iPhone, yet the portfolio is controlled via Aperture. Once you've published the Shared Photo Stream, you can add or subtract images from it, share with additional people, or unshare if needed. 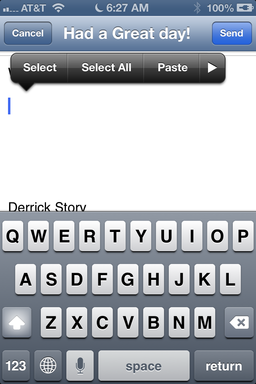 It's an easy way to create and maintain portfolios that you can show at anytime, anywhere, on your iPad or iPhone. And they look great! 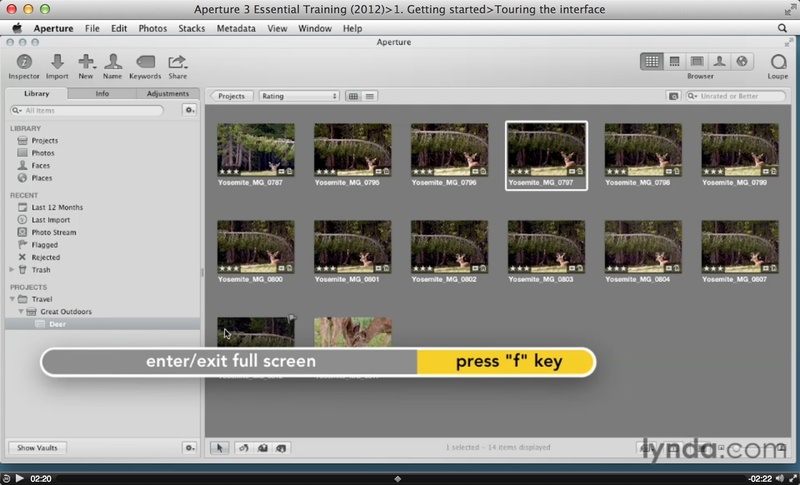 To learn more about Aperture 3, check out my Aperture 3.3 Essential Training (2012) on lynda.com. Also, take a look at our Aperture 3 Learning Center. Tons of free content about how to get the most out of Aperture. The Lowepro Passport Sling II has been my daily companion for the last two weeks in Germany. Each day, before I leave the hotel, I pack it with selected camera gear, personal items, and even a light jacket. By the time evening arrives, my back and shoulders still feel as fresh as they did when I left. 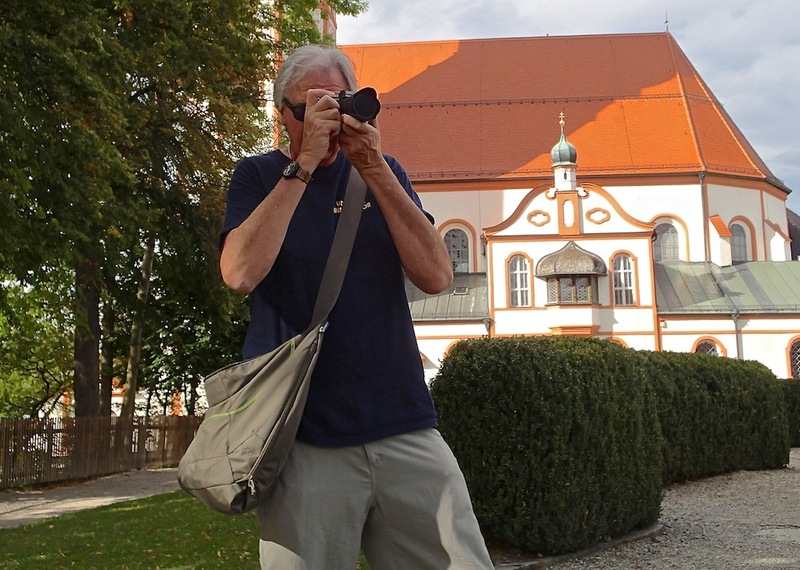 Working out of the Passport Sling at Herzlich, Germany. The key to success is not to carry everything I own all of the time. I use a Digital Video Fastpack 250 AW as my "A to B" bag. It contains a 15" MBP Retina Display, an iPad, my camera gear for the trip, and extra hard drives. It fits under the seat of the plane, so I never have to worry about checking it. 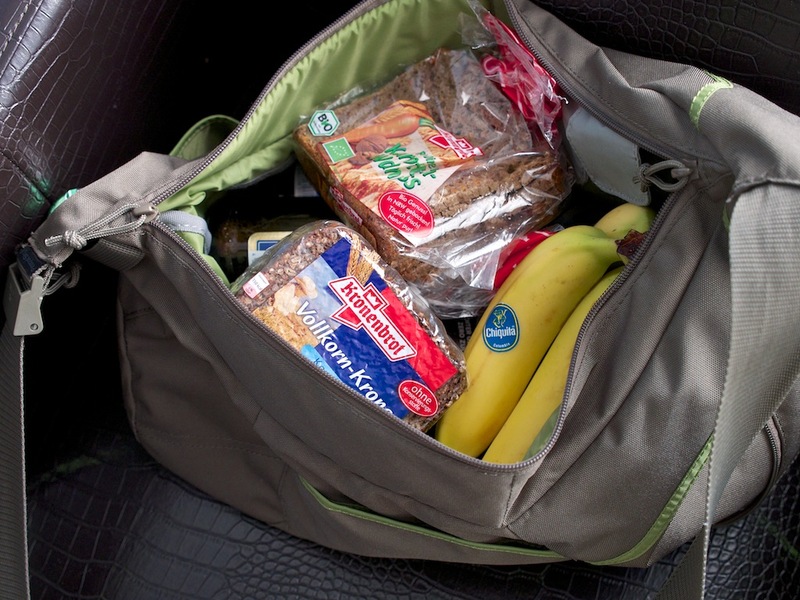 The Fastpack is an excellent bag for getting me where I need to go. The Passport Sling goes in my suitcase. Because it has a removable camera box, it's easy to collapse and stow. Once I get to my destination, I fill it with the contents I need for the day. The extra gear stays locked up in my room. I can flatten the bag so it takes up very little depth in my suitcase. I can configure the Passport Sling to hold a medium sized DSLR or my Compact System Camera kit. For this trip, I was shooting primarily with the Olympus OM-D and the Panasonic 12-35mm f/2.8 zoom. I often carried a second lens and flash, plus polarizer and a Joby GorillaPod. There were times, however, when I needed its help for more mundane tasks. For those trips, I would empty the Sling and hike to the store. Because of its large capacity, I could fit quite a few groceries inside. What really impressed me over the two weeks was how comfortable the bag is to wear. If I'm on a crowed train, climbing into a taxi, or walking for hours, the Passport Sling feels great and hugs my body. And if I need more space, I can unzip the expansion compartment that gives me about 30% more room. When shooting, I leave the top zipper open so I can quickly get to my camera. I rarely missed a shot using this approach, and I was able to keep my camera out of sight during my adventures. 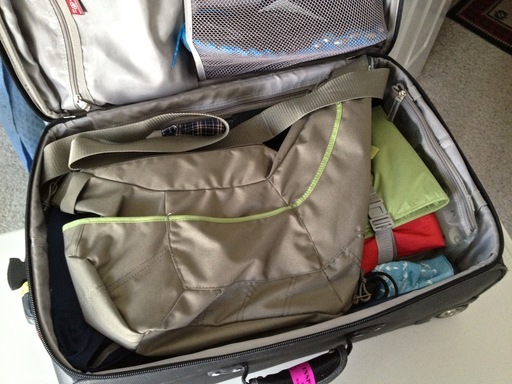 For urban travelers of any distance, this is a bag to consider. I know it has made my recent tour more enjoyable. The Lowepro Passport Sling II will be available for $65.